We recently sat down with international management phenomenon, and Ljubljana resident, Klaus Schuster to discuss living and shopping in the capital of Slovenia. Mr Schuster is perhaps best known as the author of a series of best-selling management books, in which he promotes exactly the opposite of high-brow MBA doctrine i.e. sleeves rolled-up, hands-on management with a healthy measure of common sense. Even as an apprentice in a Styrian electrical store he quite pragmatically practised with elderly ladies what we more pretentiously refer to today, in management development terms, as Customer Relationships and Customer Orientation. His books are amongst the highest circulation of current management reference works within the German speaking region, with over 10,000 copies sold in 4 different languages. Klaus Schuster Management Consulting is based in the Slovenian capital Ljubljana, and more info about the firm's services can be found on his website at www.klausschuster.eu. Would you describe yourself as an avid shopper? Not at all. I rather spend my time in the mountains, on the tennis court or with friends and family instead of walking through shopping centres. What are your favourite Slovenian souvenirs to buy for friends and family? Homemade marmalade from Belica in Medana on Goriška brda or honey from the market. Do you prefer the old town shopping experience in the city centre or the convenience of the newer retail districts on the city's outskirts? I like the smell of Ljubljana’s old town, especially the tiny restaurants and excellent wine bars like Movia or Dvorni Bar. Which international city is your favourite one in terms of shopping? What are your favourite types of items to shop for? What are your least favourite? Books at Moser in Graz, where you run over the pages while having a coffeeClothes at Kastner & Öhler, while having a glass of champagneSportswear and equipment at Intersport Eybl, where you can find the most friendly sales guysHow does shopping in the abroad compare to shopping in Slovenia? Sorry to say, but in most cases there are more friendly, competent and cooperative sales guys than in our nice country on the sunny side of the Alps. Shops in Ljubljana are mostly closed on Sundays. Is this a good thing? So far I always managed to shop during the week. Let the sales guys spend their weekends with their families like we do. 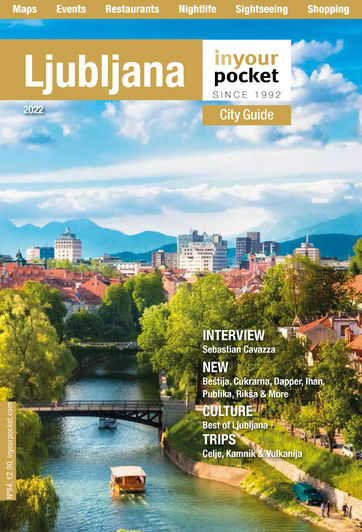 Do you have any favourite stores in Ljubljana? Did you ever experience Stefan Bauer, the bike seller in BTC. He’s creating an excellent shopping experience – for bikers of course. Practical and with demand for highest quality. Do you ever stop by the traditional market at Tržnica? Whenever it’s possible, because I admire the people selling zelje in cold winter days. It’s really worth spending my money there. Are you a fan of any local Slovene fashion designers? Can you recommend any hidden boutiques that we should make sure to include in the guide? Can you recommend any good places to shop in Slovenia outside of the capital Ljubljana?